Fresh cranberries, vodka, sugar and water turn into this delicious Homemade Cranberry Liqueur with time doing most of the work! This makes wonderful Christmas gifts, poured into pretty bottles, it’s lovely red color is gorgeous! One of my favorite liqueurs! It takes about 3 weeks so start it now! Tis the season. Oh, yes the season for Halloween, Thanksgiving and Christmas. All those things. But let’s not forget, it’s cranberry season!! Well, I don’t actually know if it’s cranberry season (don’t have a clue when they are harvested) but I do know they start appearing on the produce shelves right about now. 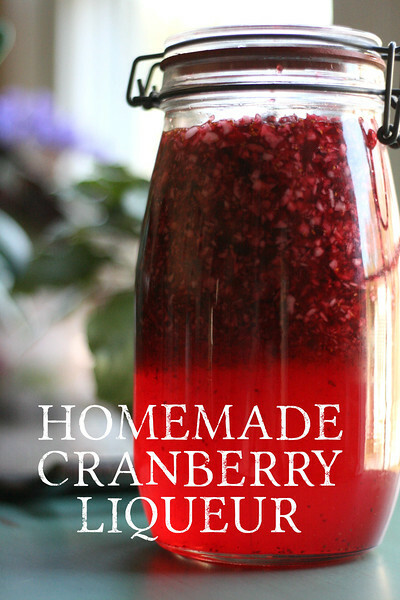 Click here to pin this Homemade Cranberry Liqueur now! If you are like me, with slight food hoarding tendencies, you probably already have about 8 bags or so in your freezer from last year. Because apparently there is nothing worse than running out of cranberries. So, you’ve made cranberry sauce, cranberry apple crumble, even cranberry muffins and you are at a loss. Well, you have come to the right place, have I got the answer for you. Homemade Cranberry Liqueur. Oh my. Quite possibly one of my most favorite homemade liqueurs, it’s easily up top with my Winter Solstice Brew. Not only does it taste amazing, it makes the best gifts! Everyone loves it’s pretty color. You will be the favorite friend again when you hand cute bottles of this out at the Secret Santa party. Place the sugar and water in a saucepan and over medium heat, cook for 5 minutes, stirring until the sugar dissolves. Remove from heat and let cool. Strain through a cheesecloth lined sieve. Pour into bottles and enjoy the pretty color! It can be stored refrigerated or at room temperature for about a year. Note - this recipe takes about 30 minutes of prep time and then 3 weeks of aging. Serving suggestion: Cranberry Cosmopolitan - Place crushed ice in a cocktail shaker. Add 1/2 cup cranberry liqueur, 1/4 cup Cointreau, and 2 tablespoons lime juice; strain into martini glasses. Yields 2 cocktails. I make a Cranberry Apple infusion using Bourbon as a base. It gets strained off through paper coffee filters. The apples disposed of and the cranberries saved. Served over vanilla ice cream. Ideally baked in an Apple pie but they don’t last that long. I keep a flask this in my freezer. For purely medicinal reasons…. We love homemade liqueurs although we haven’t tried a cranberry version. Do you think I could make the excuse cranberries are good for me? I think this would make a fantastic gift. Get a nice container and then give it at Christmas or a hostess gift when you’re invited to dinner. I’m pinning. I’ve made cranberry gin which I loved so can imagine this would be great too. I love the color cranberries give.